The risk of falling from the roof is something professionals have to deal with every day. Intensive training can teach roofers how to identify and manage hazards, but it doesn’t make even them immune to injury. Yet, many do-it-yourselfers are still confident about being a home remodeling hero. Re-shingling a small portion of your roof is already a highly technical job, let alone replacing the whole thing. Even seemingly simple projects, like window replacement, have a learning curve, which is why it’s better to leave them to real experts. Otherwise, you risk a bad installation. The state has strict licensing requirements for roofing professionals for a reason. Unless you’re a licensed roofer yourself, you’re not up to the task. A single mistake is serious enough to pave the way for water leakage. Experienced roofing and window companies will tell you that a re-roofing project usually takes about a week—when done by professionals. Non-pros need several weeks or even months to finish the job. 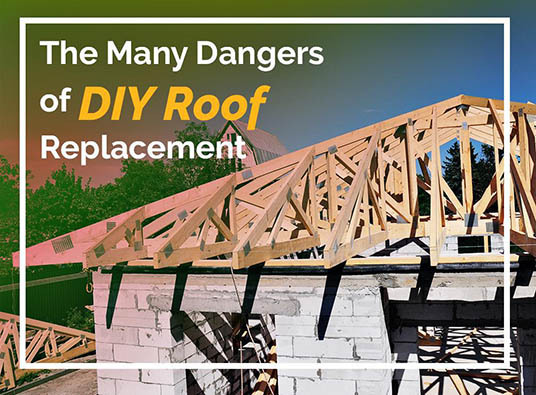 The progress of the roof replacement must be continuous to minimize your home’s exposure to the elements. The longer it takes to complete, the more your interior is susceptible to water damage when inclement weather comes. Hiring pro roofers doesn’t only ensure convenience but also insures your investment because of the workmanship warranty it entails. This is especially true when you choose a certified company for the roofing product you want. If you do the installation yourself and a failure happens due to poor workmanship, it’s going to be on you to fix it. Whether you’re buying a new roof or replacement windows, don’t forgo the services of professionals. As a certified contractor for Owens Corning, IKO, GutterCap, and Alside, Kroll Construction has the best credentials to carry out flawless work the first time. Call us at (844) 688-9632 today to schedule your FREE, in-home consultation in Michigan to talk about your roofing needs.